When the executive team at Air Georgian, an Air Canada Express partner, sat down in 2012 for a strategic planning session, it is likely that nobody considered a future that included the remote air strips of the Democratic Republic of Congo, or supporting Canada’s oil and gas sector. 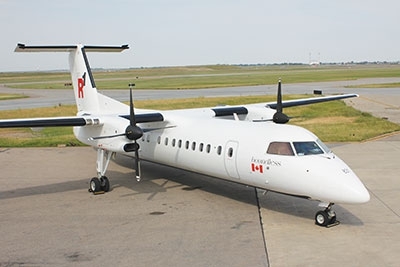 It was during a visit to Calgary by Eric Edmondson, Air Georgian’s chief executive officer to research the availability of de Havilland Dash 8 aircraft that the pieces began to fall in place. The goal of the Regional Express Aviation Ltd.
Edmondson met up with John Binder, chief executive officer of Avmax, owner of the world’s largest private fleet of Dash 8 and Bombardier CRJ Series 100 and 200 aircraft, and parent of Regional 1 Airlines, a charter operator specializing in the resource sector and delivering humanitarian aid in some of the world’s hot spots. The result is Regional Express Aviation Ltd., (REAL), a joint venture between Air Georgian and Regional 1, with a goal to be a major player in the 19- to 76-seat turboprop and jet market at home and abroad. “Our current area of expertise is in the 19- to 50-seat market. We certainly see the 76-seat market in our near future,” Edmondson pointed out. The Avmax fleet includes the 86-seat BAe 146 and 74-seat Bombardier Q400. Edmondson was appointed chief executive officer of Calgary-based REAL, while retaining the same position at Air Georgian near Toronto Pearson Airport. Avmax has representatives on the Board of Directors and plays to its strengths in areas such as leasing and asset management, and MRO (maintenance repair and overhaul), but is not directly involved in either operation. REAL places Air Georgian and R1 under a new ownership structure, and includes the rebranding and repositioning of Regional 1 Airlines to R1, with added muscle to bid on contracts in the resource sector, and leverage its expertise in international operations as an ACMI (aircraft, crew, maintenance and insurance) operator in remote regions, as well as continuing to support humanitarian efforts. It is not a one way air lane, Edmondson pointed out. Air Canada recently amended its capacity purchase agreement (CPA) with Air Georgian to operate additional regional and transborder routes using CRJ aircraft. “Access to the world’s largest private fleet of legacy Dash 8 and CRJ 100/200 aircraft was obviously a key factor in the recent award from our partner Air Canada,” he said. Still, REAL goes further than the opportunity to swap out airplanes. “In many ways, the joint venture was born because of the many layers of synergies both companies could realize through this relationship,” Edmondson added. For example, both partners not only have access to beneficial pricing for MRO services offered by Avmax, mostly relating to heavy maintenance, but also includes paint and interior modifications, spares, avionics support and engine programs. R1 benefits from Air Georgian’s membership in the International Air Transport Association (IATA), where adherence to IATA requirements give Air Georgian a vast infrastructure resulting in standards built around technology and very mature systems. This is seen as a differentiator in servicing the resource sector. Air Georgian has shifted its charter business to R1, freeing up the carrier to start focusing entirely on its CPA relationship with Air Canada. At the same time, Air Georgian keeps open ancillary revenue streams outside of the CPA, which has always been fundamental to the airline’s success. Humanitarian work accounts for a significant portion of R1’s revenue, and is often the biggest logistical challenge in terms of tapping into fleet and crew, and getting tires on the asphalt quickly. It also keeps the team sharp when competing for the bread and butter of the business. Air Georgian chief executive officer, Eric Edmondson, is one of the driving forces behind the REAL concept. “We are constantly bidding for different humanitarian and resource sector projects around the globe. These are activities where you really have to respond in a matter of days. A lot of our competition can’t do that. It takes them months to decide on what we can decide on in days. R1 is still a privately held company and we are fortunate that our ownership can respond to placing aircraft very quickly, and to places where a lot of people don’t want to go,” Pollock said. Indeed, the biggest stumbling block is often acquiring insurance for some of the humanitarian missions. Going forward, all three business partners, Air Georgian, R1 and Avmax, are expected to stick with their core strengths while leveraging pieces of the partnership to expand. “REAL is interested in continuing to play a key role in Air Canada’s regional network and being able to respond to any future growth opportunities presented to us under the Air Georgian brand,” Edmondson said. “R1 really has two key areas of operation: serving the resource sector domestically, and serving the resource, peacekeeping and humanitarian sectors internationally in remote and difficult regions. It is still early days, but given that Air Georgian and R1 will remain as separate entities with minimal overlap, it is likely that REAL will sidestep the headaches of knitting two differing corporate cultures together. An outright merger between Air Georgian and Avmax was never in the cards given the core businesses of the two players were so different, and neither side was interested in stepping outside its core competencies.